Finally done with this franchise, which I started in the very first "Superhero Media", way back in June 2014 with Superman II. As I said in the Supergirl review, the Superman series is not always the best, but the entire journey is worth taking if you never had. 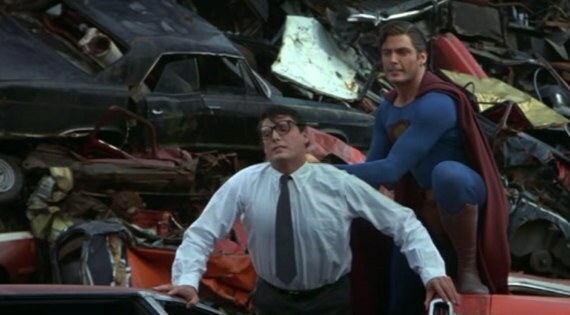 Superman III is the last duck up out of the tail-spin in the series, better than Supergirl and Superman IV, but never reaching for the heights of Superman: The Movie. Whilst I'm on the subject of the Superman film series, I'm sure someone will want to point out that Superman Returns breaks the continuity of the series with the birth of Jason (Superman and Lois's son, because they make love in Superman II), but due to the fact that Lois barely features in Superman III or Superman IV, this isn't a big deal to set right. In my "head canon", Lois and Richard have a messy divorce after he discovers that he's not Jason's father, Richard gets custody because Lois is famously in constant danger and Lois spends the rest of the film series contesting custody and harboring a resentment for Superman because of it. Took me all of five minutes to think that up. The big problem with Superman III is the tone, with the departure of Richard Donner, there is a move to a more comedic style to the film, probably most evident with the casting of Richard Pryor as the antagonistic "computer genius". Now, it's a little silly to poke fun at a film from 1983 for having funny ideas about computers, but Richard Pryor, as good a comedian as he is, doesn't really mange to sell the ideas he has to work with. The lack of quality of production in Superman III is disappointing as it really holds back some great ideas. Yes, there are some great ideas in Superman III, like trying (and failing) to synthesize Kryptonite, Superman battling a self-aware computer and the whole section with "jerk" Superman is a lot of fun to watch. Even, probably, the greatest Superman story of all time, All Star Superman, uses the black Kryptonite as a plot point, just because it's so much fun to see Superman being a selfish jerk for a little while. Lana Lang and more time spent in Smallville are also nice touches, fleshing out the setting a bit more. 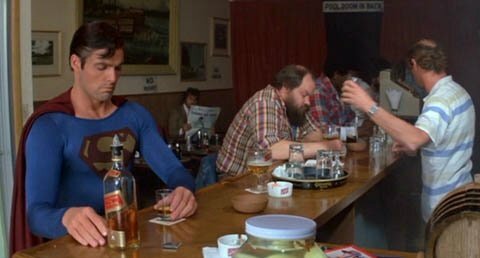 Superman III is an odd beast, in many ways it more closely resembles the comics of the time in which it was made than any other Superman film, but it still feels like a let-down after Superman II. The thing is, most comics just don't translate well to the medium of film, though Superman is actually no easier or harder than any other hero. This is why I'm usually happy to watch pretty much any superhero film I can get my hands on, even the bad ones. Yes, it's great to live in a time where Marvel Studios is stamping out brilliant films with almost alarming regularity, but let's not forget where we came from. We need to keep watching the "not-quite-good-enoughs" along with the outright classics, films like Superman III, Batman Forever and Fantastic Four that got the genre to the dizzying heights that we're at now. At least look up the fight between Jerk Superman and Clark Kent in the junkyard on YouTube, it's a great little sequence.